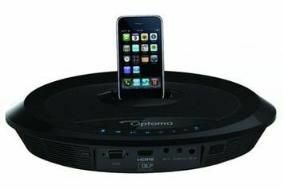 CES 2011: Optoma combines projector with iPod dock | What Hi-Fi? Optoma's Neo-i does all the usal iPod/iPhone dock stuff, but also comes with a built-in projector. The mini-DLP unit allows you to display video and still images on virtually any surface. The tabletop design includes a 16W stereo speaker system and has additional inputs for hooking up external sources. It uses a LED light source and 50 ANSI lumen Pico projector, capable of delivering a 16:9, 854 x 480 pixels WVGA image up to 120in. Inputs for other devices include HDMI and VGA. An optional battery pack can be used to power the Neo-i, and its bulb is rated at 22,000 hours. The top-mounted iPod/iPhone dock charges your portable and naturally allows playback of your music and other digital media. Optoma's Neo-i has just gone on sale in the US for $449.